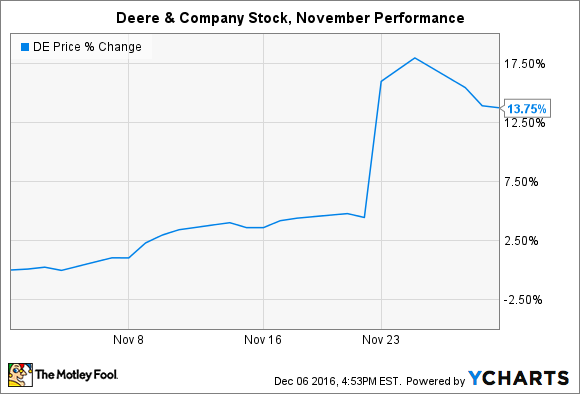 Christmas has arrived early for shareholders of Deere & Company (NYSE:DE). The company continued a torrid end-of-year pace by rising 13.7% in November, which pushed year-to-date stock gains to 34.6%. That's impressive considering the stock's year-to-date gains in mid-September were just 5%. It's also impressive if you consider that sales and earnings were down in fiscal 2016, but the devil is in the details. Deere & Company announced fiscal 2016 results on Nov. 23, which promptly sent shares soaring. Full-year sales and earnings per share dropped 10% and 16%, respectively, than watermarks set last year. That's not too surprising given the global headwinds facing industrial equipment manufacturers this year, especially those dependent on agricultural sales. But that doesn't answer the question: Why are shares up? There's also a sense that this downturn could have been much worse. It will actually get worse still, as management expects 2017 sales to drop 1% compared to 2016. The bad news is that the outlook amounts to a reduction of about $233 million. The good news is that reduced costs and restructuring could more than offset the drop in sales. Restructuring efforts currently underway are expected to deliver $500 million in savings by the end of 2018. The better news is that Deere & Company is well positioned for long-term growth for each of its three segments: agriculture and turf, construction and forestry, and financial services. The company's growth strategy has been validated throughout the globe, and management insists that the current downturn would have been much worse if not for its stellar execution in recent years. In addition to enthusiasm for future growth potential, investors should consider that Deere & Company stock is up 34.6% in 2016 because it began the year at multiyear lows. Given that sales and earnings are likely to contract again in 2017, investors probably shouldn't expect a repeat performance in the next 12 months. But if and when a global recovery in commodities arrives, the company appears to be poised to resume its long-term growth trajectory.